CARMEL, Calif. – July 19, 2016 – A guest artist in the Automotive Fine Arts Society (AFAS) exhibit, Dan McCrary will display a trio of richly colorful automotive artworks honoring timeless classics at the 2016 Pebble Beach Concours d’Elegance® on Sunday, Aug. 21. McCrary, a lifelong enthusiast, uses watercolor to capture the elegant details of automotive history, finding beauty in every aspect of a vehicle. Sponsored by The Lincoln Motor Company, the 2016 AFAS exhibit at the 18th fairway of Pebble Beach Golf Links in beautiful Pebble Beach, California, will showcase the latest creations from the world’s finest automotive artists from 9:00 a.m. to 4:30 p.m.
One of McCrary’s pieces is a 25” by 17” watercolor of a 1960 Lincoln Continental’s rear panel. The abstract depiction is appropriately titled “Bling”. An examination of the panel’s reflective surface, the piece has a shimmering effect shown through the bright silver, blue and red hues. Another work in watercolor, titled “Mercurious,” is an isolated section of a red and black ’55 Mercury. The presentation of water droplets on the vividly red surface brings a sense of realism to the abstractly designed piece. 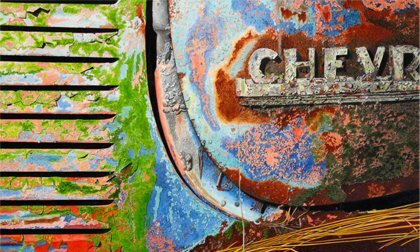 McCrary’s third piece is a watercolor titled, “On A Hill Far Away Stands An Old Chevrolet.” The pastel palette of blues, greens and pinks exposes beauty in the rusting Chevy pick-up truck, revealing its history through the many layers of paint. Dan McCrary was born in Raleigh, North Carolina, in 1949, and his earliest memories are of old Ford Coupes with loud, unmufﬂed ﬂathead engines roaring around the quarter mile oval at the old Raleigh Speedway in the mid 1950’s. That was the point of no return, so to speak. The sound, the colors, the spectacle of it all had him hooked for life. Though he never lost his car lust, he went on a detour through the music business that lasted quite a few years. After playing music on the road for some time, he worked in a music store, played with sports cars, and took up drawing/painting cars again, on the side. Eventually Dan transitioned into automotive artist on a full time basis around 1980, with watercolor evolving into his medium of choice. Dan started researching car shows in Hemmings Motor News as venues for his art. As he traveled and gained more exposure, he began getting invitations to participate in juried/invitational automotive art exhibits at Concours d’ Elegance around the US. Dan has been featured in a wide variety of automotive publications, as well as winning awards at many of the Concours. His work can be found in several prominent individual and corporate collections.